The Atlantis astronauts successfully unfurled a second solar array today, giving the international space station a new set of wings stretching some 240 feet from tip to tip and completing the primary goal of the 116th shuttle mission. While the mission is far from over - a third spacewalk is on tap Friday - getting the new solar arrays attached and deployed marks a critical first step in the resumption of space station assembly after a three-and-a-half-year hiatus. "We're happy to be here to tell you the truss, the P3/P4 truss is installed, the SARJ joint's checked out, the solar arrays are deployed, we're in outstanding shape," space station Program Manager Mike Suffredini told reporters. "The bottom line is, this flight has gone better than my wildest dreams." This afternoon, NASA released spectacular video of Atlantis' launch Sept. 9 that was shot by cameras mounted on the ship's twin solid-fuel boosters and in a WB-57 jet aircraft flying at 60,000 feet near the launch pad. The booster cams showed no obvious problems with the shuttle's external tank insulation and no signs of any heat shield damage. While the WB-57 footage was not as sharp, it provided dramatic views of the shuttle well after booster separation, including ignition of Atlantis' orbital maneuvering system engines for additional boost. 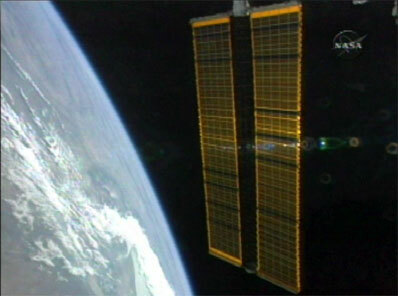 But deployment of the space station's huge new solar arrays was the clear highlight of today's activity in space. The P3/P4 arrays are needed for the next planned assembly mission in December as NASA works through a complex sequence of flights that must be accomplished in series to build out the lab's main solar array truss and prepare the station for arrival of European and Japanese research modules. The only real hitch in an otherwise by-the-book mission was a software commanding problem Wednesday that held up test and check out of a drive system needed to rotate the new arrays to keep them face on to the sun as the station circles the globe. As it turned out, the glitch was actually a safety feature built into higher level supervisory software that controllers had not taken into account. Once they did, checkout of the solar alpha rotary joint, or SARJ, went smoothly and the Atlantis astronauts were cleared to press ahead with array deployment early today. During extension of an identical set of arrays in 2000, many of the compressed slats in the solar blanket initially stuck together due to the effects of low temperatures and atomic oxygen. When the stuck panels broke free during deployment, the arrays oscillated more than expected and caused a tension cable to jump from its guide. The system was repaired during a spacewalk and procedures were changed for today's deploy. Flight controllers first extended each wing a few feet to improve warming and release compression. Then the astronauts deployed the panels, one at a time, first to 49 percent and then, after waiting for more solar warming, out to a full 100 percent. The extension was done in a high-tension mode to help prevent the panels from pulling up at the bottom as the self-assembling masts extended. The procedure worked as planned and no problems were encountered. "Good deploy of the 2A array, very similar to the deploy of the 4A array," Atlantis commander Brent Jett called around 8:45 a.m. after the second wing was fully extended. "Good day for space station," replied astronaut Pam Melroy from mission control in Houston. "We confirm the solar array is also fully deployed on telemetry. Congratulations!" "We're very happy to get the array out today," Brent said. "There was never any motion on the tension mechanism until it was supposed to move at the very end. There was, however, quite a bit of spring tension and when the (stuck) panels would release, the boxes would move quite a bit, but that was the same on both arrays." Suffredini was elated with how the deployment played out. "A lot of folks have spent time talking about a couple of bolts (and) the software feature we rediscovered last night," he said. "But if you told me before this flight these were the only issues we were going to deal with as a program, I would have taken that and run. The only real problem I have is getting everybody to understand when we say these things are hard, really believing us, because the next flight is going to be even more difficult. "But we're ecstatic today," he said. "The vehicle has performed in an outstanding way, the systems that make up the P3/P4 truss have all performed as advertised and we're well on our way to returning to assembly." The new arrays, known as P4 because they're part of left-side truss segment No. 4, were wired into the station's electrical system earlier this week during a spacewalk by Joe Tanner and Heidemarie Stefanyshyn-Piper. But the panels will not begin providing power to the station until December, when the next shuttle assembly crew arrives to carry out a major electrical system rewiring. During that flight, the left wing of the P6 solar array, currently positioned at right angles to P4 at the top of the station, will be retracted, permitting the new panels to rotate as required to track the sun. The P6 array will be moved next August to a position just outboard of P4, completing the left side of the station's main power beam. Two other arrays will be attached to the right side of the truss in February 2007 and June 2008. For the Atlantis astronauts, a third spacewalk is on tap Friday, starting at 5:15 a.m., to complete final closeouts of the new hardware and to repair S-band and KU-band antenna systems on the station. While Tanner and Joe Tanner Stefanyshyn-Piper are outside, Jett and shuttle pilot Chris Ferguson plan to deploy a set of folded radiator panels on the P4 truss to provide cooling for internal electrical components. The 1,600-pound radiator, made up of seven hinged panels housing two ammonia coolant circuits, will extend 44 feet when fully deployed at right angles to the axis formed by the array wings. "You just can't imagine a flight being better than this one has been," Suffredini said. "Now, as we go further along, we won't have had as many years training and some of the jobs will be less difficult than what we did with the installation of this truss, some will be the same, some will be more difficult. "And so I love the first step that we've taken and I think that's great for the team and I think that speaks volumes of the work we have to do. ... If you believe what this flight tells you, we've got a pretty good fix on what it takes. But we know we've got a lot of challenges in front of us. ... We'll be cautious with you and with ourselves to not get too overly optimistic. We're going to keep asking ourselves questions." See our earlier story for more background details on the arrays.